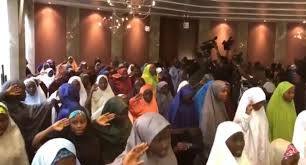 The Dapchi schoolgirls released from the captivity of Boko Haram insurgents on Wednesday, March 21, are currently meeting with President Muhammadu Buhari at the Presidential Villa in Abuja. Premium Times reports that the meeting between the girls and the president is holding at the press gallery of the state house. The newspaper stated that the girls were flown to Abuja on Thursday, March 22, received medical evaluation and were debriefed prior to meeting the president. The personal assistant to the president on new media, Bashir Ahmad, tweeted earlier that Buhari was to meet with with 107 Dapchi girls who were released by the insurgents.